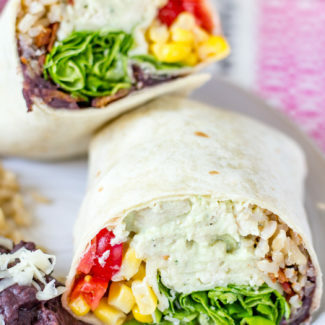 Ranch Chicken Avocado Bacon Burritos are an easy to prepare meal made with shredded chicken that is slathered in an avocado ranch crema, crispy bacon, cheese, tomatoes, corn, refried beans, rice, and lettuce. Some of the best foods have brought together in one amazing burrito. 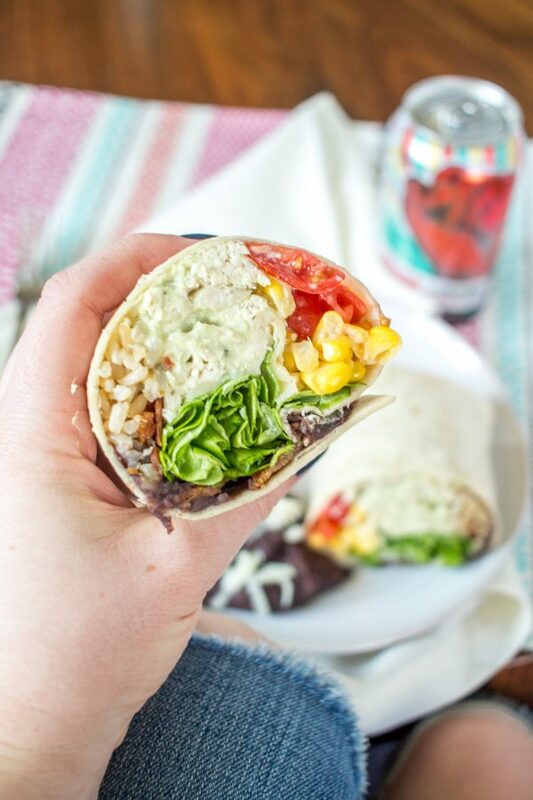 This burrito takes its inspiration from a cobb salad. This wasn’t really my intention, it just happened. 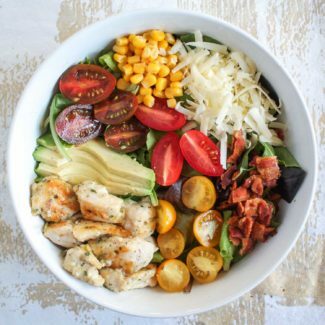 Corn, bacon, chicken, tomatoes, beans, cheese, and lettuce are all common ingredients in a cobb salad. The same goes for ranch dressing and avocado. It seemed a little odd to add ranch dressing to a burrito, so I made a simple avocado ranch crema and added it to the shredded chicken. This recipe takes advantage of some simple time saving hacks, because I don’t like waiting long for a burrito. I used a store-bought rotisserie chicken and shredded it. And the rice is just a bag of Uncle Ben’s Brown Rice which cooks in the microwave in just 90 seconds. Thanks to these timesavers, the only real work is making the avocado ranch crema, cooking the bacon, and heating up the refried beans and chicken. 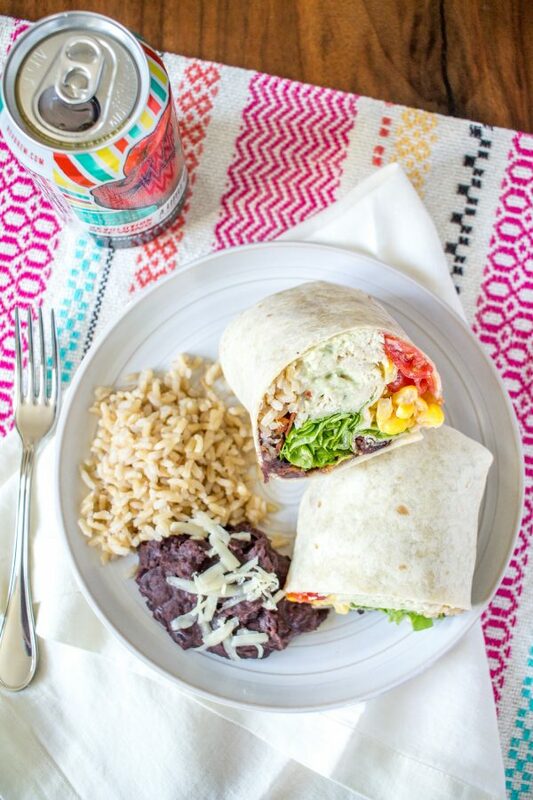 You are only 20 minutes away from burritos. 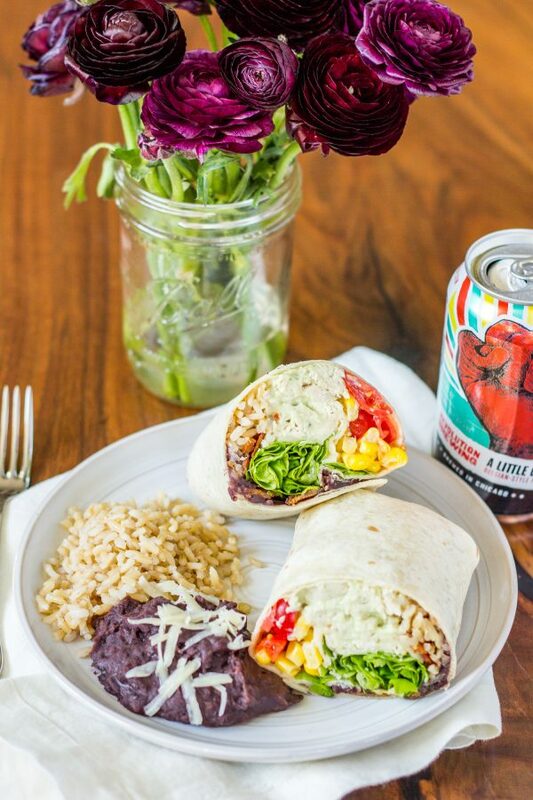 The refried beans hold this burrito together, literally. Refried beans are burrito glue. Even though I stuffed the burrito full of meat and veggies, it didn’t fall apart. The trick is just to put the refried beans on the top so that they will end up on the seam of the burrito and hold it together. I love the crispy bacon in these burritos. It just gives the recipe some extra oomph. 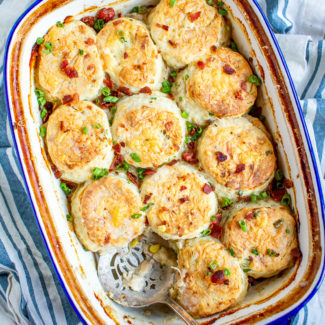 The bacon is the only ingredient that needs to be cooked, so put it in the oven first, and then get to work on shredded the chicken, and making the crema. By the time the bacon is ready, you will have all of the other burrito ingredients ready too. I made Ranch Chicken Avocado Bacon Burritos for dinner one night, but had enough leftover ingredients to keep eating burritos for lunch for the next few days. 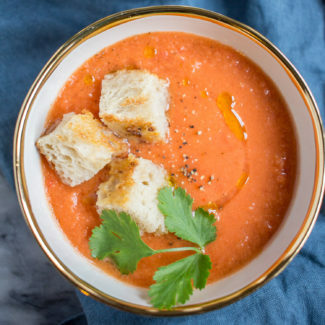 They are a delicious meal that is packed with fresh veggies, that can be prepared very quickly. If you won’t want to make a burrito, you could serve the chicken, bacon, tomatoes, corn, and rice over a bed of lettuce. Swap the refried beans for black beans, and then drizzle the avocado ranch crema over the top! 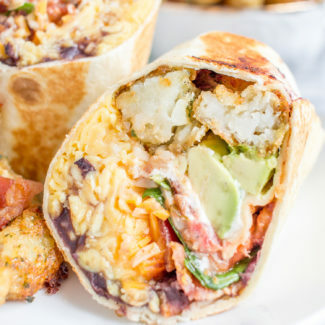 Ranch Chicken Avocado Bacon Burritos are an easy to prepare meal made with shredded chicken that is slathered in an avocado ranch crema, crispy bacon, cheese, tomatoes, corn, refried beans, rice, and lettuce. 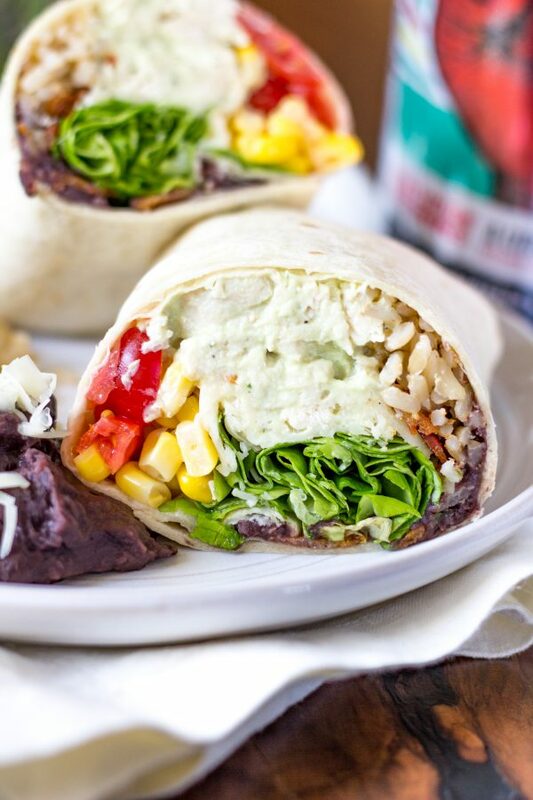 It is some of the best foods that have brought together in one amazing burrito. First you want to cook the bacon. 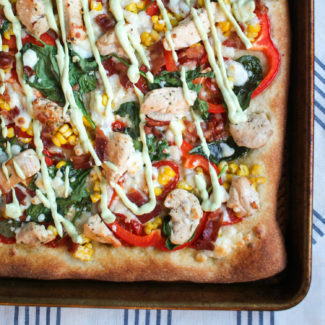 Place it on a parchment lined baking sheet and bake it for 10-12 minutes at 375 degrees. While the bacon is cooking, prepare all of the other ingredients. 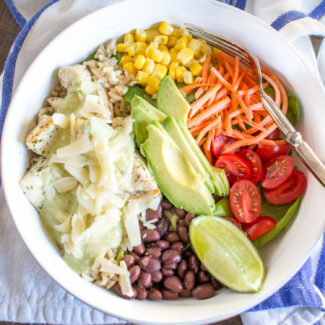 Shred the chicken, grate the cheese, chop the tomatoes, warm up the beans, chop the lettuce, and cook the rice. Prepare the avocado ranch crema by combining all of the ingredients in either a food processor or blender. You want it to be thick enough that it will stick to the back of a spoon, but thin enough that it is pourable. Once the bacon has cooked, chop it or crumble it. I like to heat the chicken up in some of the crema. I do this in a skillet over medium heat for about 3 minutes. If your chicken is already warm, feel free to skip this step. To assemble the burritos I first heat up the tortillas. I do this by placing them over a gas burner, one by one, and turning the heat onto medium and heating each side of the tortillas for about 5 seconds. This process makes them softer and easier to work with. Assemble the burritos one by one. First add some refried beans to the top of the burrito. Then add rice, chicken, tomatoes, bacon, corn, cheese, and lettuce. Fold the sides of the tortilla over, and then roll the tortilla up from bottom to top. Serve immediately. If you won't want to make a burrito, you could serve the chicken, bacon, tomatoes, corn, and rice over a bed of lettuce. Swap the refried beans for black beans, and then drizzle the avocado ranch crema over the top!